The first rule of reviewing is be impartial. To assess the subject in the cold light of day and try to express your thoughts freely, unhindered from ones own personal thoughts and relay to the reader concise information. So before me is a copy of Judge Dredd Day of Chaos: Fallout and below are 2 reviews. The first is for those who already read 2000AD, the 2nd for newcomers. 2) Ooh this is good. So very, very good. So good you’d wished you’d read it before. This anthology of events post ‘Chaos day’ show how much care and attention is brought to 2000AD’s big law-giver. For those just joining events now, the seeds of Chaos Day were sown way back in Prog 270 (1982!!!) when the Apocalypse War was ended by Dredd destroying East-Meg One (It was the 80’s, the cold war was very much in the freezer) an event which led to the East Bloc releasing the Chaos Virus 30 years later. 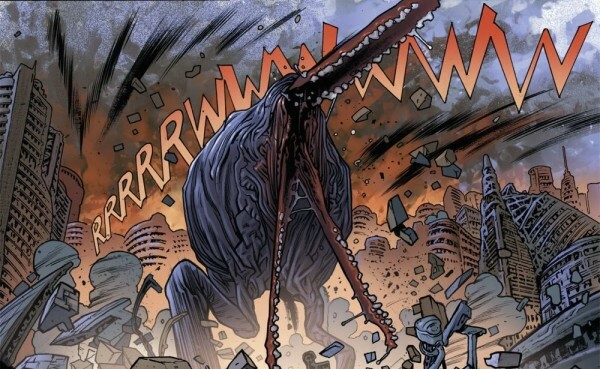 This caused mass destruction and released the dreaded Dark Judges Fire, Fear & Mortis (Evil judges from a spirit dimension. Stay with me) which knocked Mega-City’s population from 400 million to 50 million. 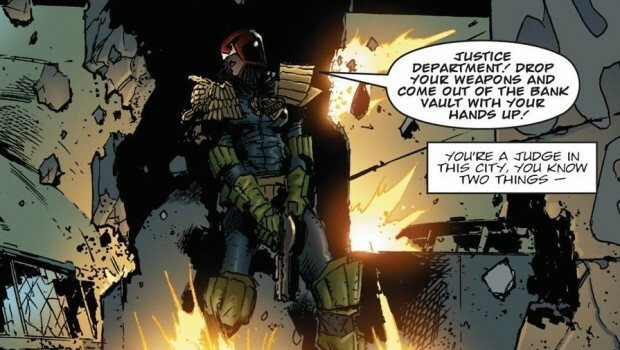 The longevity of Dredd is built into the story as it really has been 30 years since the war and this feels worthy of the other major stories in the series such as The day the Law Died and The Dark Judges.Needless to say as much care has gone into the artwork and each page is in sumptuous colour and detail. It’s difficult to chose, which is best, but Laurence Campbells work on ‘Innocent’ is bang on as shown below.